You've posted your digital images on your web site or a public photo hosting site, and thinking, "Wouldn't it be nice if I could add a signature on all my images?" Here is one easy way to do this in Photoshop Elements. Photoshop Elements has the concept of "layers" that sounds complicated but really isn't. You can think of a layer as simply being a transparent page. Unlike a real-life transparent page that does mask the original image beneath a little, the digital version is 100% transparent. Just like illustrators use transparent pages to add shadows on one layer, colours on another, text on a third, etc. -- so the original image is untouched, and each graphic expert does not muck up the work of the other -- Photoshop layers allow you to do the same. So, that's great, because this means that you can do all your image editing on one or more layers (as many layers as you need) without touching the original image. And if you make a mistake, just chuck out that layer and start with a fresh one. Want to experiment on different text effects, create a layer for each effect, and then hide or display them one by one to see which one you like the best. How do we create a layer? You can do so thru the menu (Layer - New - Layer...) or, if you have the Layers Palette already open (simply drag the Layers tab to your work space), click on the "Create a new layer" icon (highlighted in red below). 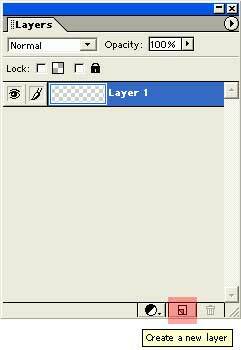 To select a layer to work on, simply click on that layer in the Layers Palette. To delete a layer, Right-Click on that layer in the Layers Palette and select Delete Layer - Yes. Ok, so now that we have the basics of creating and removing layers out of the way, let's create our signature layer that we will then use on our images. All tutorial material, including images and graphics, are property of Photoxels.com and may not be reproduced in any form without prior written consent from Photoxels.com. Privacy Notice. Copyright © Photoxels. All rights reserved.